The Redwood is one of our rambler homes that boasts an expansive floor space. Thanks to its finished floor area of 1,925 square feet, it can accommodate a spacious veranda, a study room, and a large room that features the family area, dining area, and kitchen. 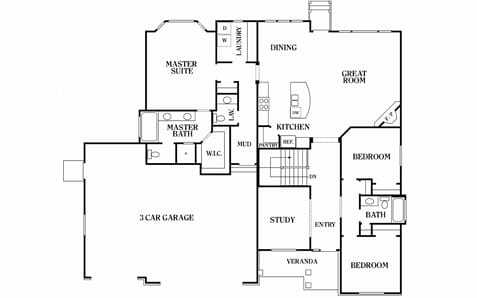 It even comes with 3 bedrooms, one of which is the master suite that has its own master bath and walk-in closet. What’s more, you can upgrade its floor plan by adding an optional three-car garage. Perry Homes Utah has been in the heritage home building business for over 40 years. As such, we know exactly how to construct affordable rambler and two-story homes for every type of household. We offer a wide range of models that feature unique floor plans and optional room changes. In addition, our design specialist will be more than happy to walk you through our list of designs and help you make informed decisions on your home upgrades. When you’re ready to find the perfect Utah home, contact Perry Homes Utah. Our company provides a seamless and hassle-free buying process because we believe that purchasing a new house shouldn’t be a stressful experience. We’re also dedicated to help you every step of the way, from the initial planning stages all the way to choosing interior and exterior home upgrades. Plus, our lines are open even after the build to address any post-construction concerns. Give us a call at 801-264-8800 and let’s talk about your dream home today.